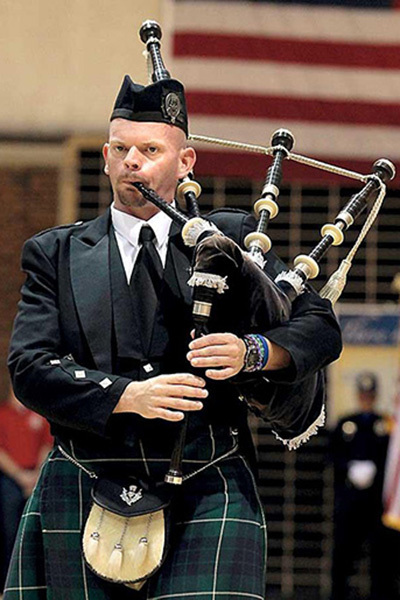 I got on the Internet to see what I could find about bagpipes and was overwhelmed by what I found (this was my first time to use the internet). I found a pipe shop in Houston TX and called to find out more information about piping. I learned what I needed to get started and was referred to a teacher as well. Two months later I took my first lesson. I continued to have lessons weekly. I often practiced for 2 hours a day and enjoyed every chance I got to practice and to have lessons. I reached the point where I was ready to start working with the pipes after 6 months of working on the practice chanter. A set of pipes was loaned to me and I began “squeezing a bag of cats.” The beginnings were pretty rough but got better as I started to play tunes that people could recognize. I could play in public and not embarrass myself 10 months after my first lesson. I was able to play only a few tunes but began to play at schools and funerals. As time when on I played for more funerals and began playing at weddings. My instructor thought I would be a good teacher for beginners. I started teaching 7 months later. I continued to teach and had as many as 25 students whom I taught over a period of time. Some would come and go but I have always had a consistent flow of students. Lars Sloan, whom I worked for, wanted to take the students that we had and start forming a band. He asked me to be pipe sergeant. I was also the pipe sergeant in the Houston Police Pipes and Drums where I have led the band in parades and funerals. Currently I teach students out of my house and play weekly at many events across the Houston and surrounding areas. Some of the events I play for are funerals, weddings, parties of all kinds, golf tournaments, and the list continues. On an average of 3 to 4 times a year, I travel out of the country to places in Africa and Asia to share this gift of bagpipes to people who have never heard the sound of the bagpipes. This gives me a unique opportunity to talk about the bagpipes to many wonderful people. When it comes to playing the bagpipes, nothing gives me greater joy than to see the gratitiude in the families of whom I have played for. Give Houston Bagpiper a call at anytime if you have any questions about the service I offer. Thank you for choosing Houston Bagpiper. I am available for piping gigs. To my Lord and Savior I give all glory for the things he has given me.